Dr. Roger Montz believes in offering patients quality, comfortable, and compassionate dental care. 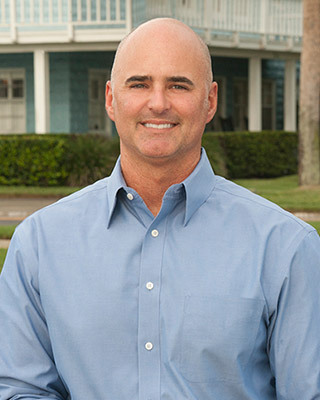 His dedication to continuing education and commitment to bringing the latest procedures and techniques to his practice guarantees his patients will receive the best treatment available. Dr. Montz received his undergraduate degree from the University of Florida in Food Science and Human Nutrition. He earned his D.M.D. in 1996 from the University Of Florida College Of Dentistry. His academic achievements also include graduating from the Las Vegas Institute for Advanced Dental Studies in full mouth rehabilitation. He routinely attends continuums on implants, bone grafting and other dental advancements to further enhance his expertise. Dr. Montz is a member of the Florida Dental Association, American Association of Cosmetic Dentistry, International Team of Implantology, American Association of Implant Dentistry, and the Academy of Osseointegration. He has been practicing with Dr. Hunter Collins, his classmate from the University Of Florida College Of Dentistry, since 1999. Dr. Montz is married to Lauren Kay Montz and they are the proud parents of a daughter and son.